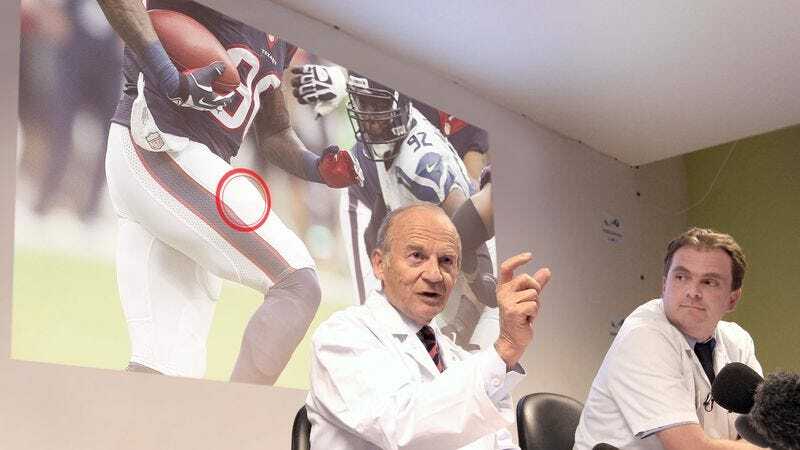 PALO ALTO, CA—In light of a troubling number of major injuries in the NFL this season, a new study published Monday by the Stanford University Sports Medicine Center revealed that the only safe part of the body to tackle a football player is a 4-inch portion of the right thigh. “Our findings showed players have a substantially higher risk of incurring critical, sometimes permanent damage when receiving a hit anywhere outside this 10-centimeter-square area of the upper right leg,” said lead researcher Dr. Mark Domianci, explaining that regardless of age or level, all football players should avoid direct contact to the head, neck, chest, back, shoulders, arms, abdomen, hips, knees, shins, and ankles. “Given how much bigger, faster, and stronger today’s athletes are becoming, the only way to prevent serious head trauma, high-grade muscle tears, bone fractures, or spinal injuries is by ensuring players target this small region of the right thigh when delivering a hit. Tackling anywhere else on the body—even just a few inches from this area—is extremely dangerous for both players involved.” Domianci went on to recommend that as a general rule, no one should ever play the sport of football under any circumstances. When reached for comment, an NFL spokesperson assured reporters that the league would take this new study into account while implementing an 18-game regular season.